$200 Million in gift cards and rewards given out to its members. 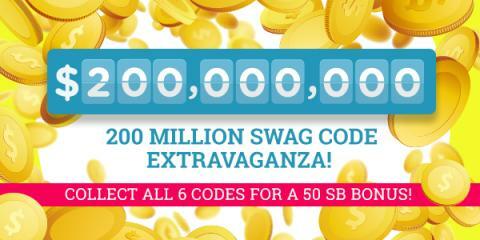 They are continuing the celebration with the 200 Million Swag Code Extravaganza! The 200 Million Swag Code Extravaganza begins on Wednesday September, 20th at 7AM PT/10AM ET. Please note: The above times are for CA only. Requested Oct 13/08 - asked for Candy Cane & Ocean View. Thank you for requesting scent samples. Samples will be mailed to you within 5 business days.